First Australians; Aborigines, Torres Strait Islanders, Indigenous and Aboriginal peoples. Original Australians. Tweed Aboriginal Cultural Heritage, Northern Rivers NSW. Prior to 1788, Aborigines occupied all of mainland Australia and most of the inhabitable islands near the coast, including Tasmania. 'Aborigines' was not the name these people used to describe themselves. It was the name given to the first Australians by the Europeans because it means the original inhabitants of the country. Aborigines use the names applicable to their own groups. They are likely to call themselves by the name of the language or territory group to which they belong, for example, Wiradjuri, Pitjantjatjara, Kamilaroi, Gurnai, Aranda. They may also use a general term like Murri, Koori, Nunga, Nyoongah or Yolgnu. Torres Strait Islanders use the name of their island community to describe themselves, for example, Badu, Murray, Yam, Boigu. The Torres Strait Islands lie in the Torres Strait which is the stretch of water that separates Cape York Peninsula in north Queensland from Papua New Guinea. Throughout the 50,000 years or more that Aboriginal people have been on the continent, they have had to adapt to dramatic changes in their environment caused by variations in climate and movement of landmasses. Wooden tools rarely survive in the earth, but we know from one unique archaeological find that the boomerang (and the barbed spear) was invented more than 10,000 years ago. Rock art shows changes in wooden tools and such other perishable items as headdresses. Around 5,000 years ago there was even a radical change in the stone tools themselves, with small, delicately worked points and blades beginning to be produced. This change may have been associated with the use of composite tools, that is, with points used on a spear in place of a sharpened wooden end. 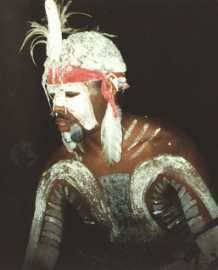 Throughout the ancient history of the Aboriginal people there were many changes more important than technological ones. Many different styles of rock art appeared in different regions and changed over time, from the stylised, symbolic ancient engravings to the colourful X-ray art of the north and the vivid hunting scenes of east and west. Together with changes in burial practices, such differences undoubtedly reflect changing religious beliefs and rituals. Aboriginal sites and places are recognised by traditional custodian descendants as tangible evidence of our ancestor's cultural practice and traditions; as such, they retain a very real and meaningful value through to the present day. Scientific assessment of cultural evidence from some selected sites supports the fact that Aboriginal people were living in the Tweed from at least 10,000 years ago, and a Carbon-14 dated midden and occupation site on Stradbroke Island (in South East Queensland) is recorded as more than 20,000 years old. Our Aboriginal oral tradition tells a story of 'Three Brothers' who came to this land and its people in the 'Dreaming', gave the lore, and formed the nucleus of tribes with whom today's traditional custodian descendants identify. A common feature of our Aboriginal identity is language, which is known in the Tweed and further south as Bundjalung; in south east Queensland people prefer Yugambeh; and further west, in Kyogle Shire, people use Githabul as both a language and name for group identification. The language dialect for the Tweed is known as Ngandowal, a name referring to the people who say 'Ngando' for the word 'who' or 'somebody'. However, part of the Tweed Coast and south to the Byron area is Minyungbal, where the word 'Minyung' means 'what' or 'something' and can be used as identification for people of this area. There is general acceptance among our Tweed Aboriginal community for the presence of three main groups in the Tweed River Valley. These were the Goodjinburra people for the Tweed Coastal area, the Tul-gi-gin people for the North Arm, and the Moorang-Moobar people for the Southern and Central Arms around Wollumbin (Mt Warning). However, European settlers used other names and described them as Chubboburri, Gandowal, Duthurinbar, Wirangiroh, Wollumbin, Murwillumbah, Ngarrumbul, Kitabul, and Ngarartbul. These names largely reflected a lack of understanding of our culture, our language and our connection to each other. "Tweed History" excerpt from "Aboriginal Cultural Heritage", Tweed Regional Museum - Murwillumbah. "Aborigines, Torres Strait Islanders, Indigenous and Aboriginal peoples"; Encyclopedia of Australia 1996. Published by Webster Publishing, 1995. Copyright Webster Publishing, and/or contributors.